Because the genus Agrilus Curtis includes significant forest pests, the association of a poorly known species, Agrilus macer LeConte, with unexplained sugarberry (Celtis laevigata Willd.) mortality in the southeastern USA is a cause for alarm. 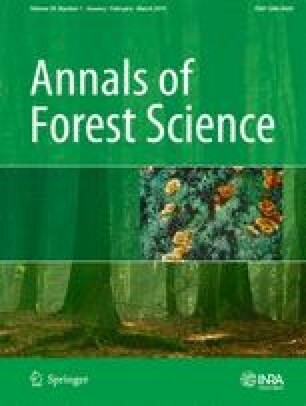 This study sought to investigate the distribution and biology of A. macer and determine whether the species is a primary cause of observed tree mortality. Through a series of studies and literature searches, we documented aspects of A. macer biology and distribution while focusing on egg-laying behavior and searching for fungal pathogens associated with oviposition sites. A. macer appears to be widely distributed throughout the southern USA, but most records are from Texas and Louisiana. Egg mass densities up to 1.2 masses per 10 cm2 (equivalent to ~ 1.9 eggs per cm2) were observed on trunks, branches, and exposed roots of dying C. laevigata trees in our study area, with an average of 16 eggs per mass. Fungi isolated from discolored sapwood around larval galleries did not cause defoliation, dieback, or mortality of sugarberry in inoculation trials. Our findings suggest that A. macer is a secondary pest on sugarberry and does not transmit harmful fungal pathogens. Michael Ulyshen conceived of the studies on the distribution and biology of A. macer while Rabiu Olatinwo and Michelle Cram led the search for potential pathogens. Field work was performed by Michael Ulyshen, Scott Horn, Emilee Poole, Stephen Fraedrich, and Michelle Cram, while Rabiu Olatinwo isolated fungi from some samples and sequenced fungal isolates. Michelle Cram and Stephen Fraedrich conducted pathogenicity tests on fungi. Emilee Poole and Michael Ulyshen analyzed the results and wrote the paper with contributions from all co-authors. We thank Roy Kibler for permission to work along the Greeneway in North Augusta. We are also grateful to the following individuals for responding to our request for specimen information: Lee Herman (American Museum of Natural History), Melissa Callahan (Auburn University Natural History Museum), Jacqueline Airoso (California State Collection of Arthropods), Patrice Bouchard and Anthony Davies (Canadian National Collection of Insects, Arachnids, and Nematodes), John Rawlings and Robert Androw (Carnegie Museum of Natural History Invertebrate Collection), John Morse and Mike Ferro (Clemson University Arthropod Collection), Christopher Grinter (Entomology Collection of the California Academy of Sciences), Jim Louderman and Crystal Maier (Field Museum of Natural History Collection of Insects, Arachnids, and Myriapods and InvertEbase, NSF Award EF 14-02667), Rick Hoebeke (Georgia Natural History Museum), Philip Perkins (Harvard Museum of Comparative Zoology), Tommy McElrath (Illinois Natural History Survey Insect Collection), Louisiana State Arthropod Museum, Gary Parsons and Anthony Cognato (Albert J. Cook Arthropod Research Collection at Michigan State), Terence Lee Schiefer (Mississippi Entomological Museum), Weiping Xie and Brian Brown (Natural History Museum of Los Angeles County), Hellen Vessels (New Mexico State University Arthropod Collection), Bob Blinn (North Carolina State University Insect Collection), Luciana Musetti (Ohio State Triplehorn Insect Collection), Phil Mulder and Jana Slaughter (Oklahoma State-K.C. Emerson Entomology Museum), Robert Androw Private Collection, Charyn J. Micheli and Eugenio H. Nearns (Smithsonian National Museum of Natural History), Karen Wright (Texas A&M Insect Collection), Texas Tech Insect Collection, Wendy Moore and Wesley E. Hall (University of Arizona), Michael S. Engel (University of Kansas Natural History Museum), and Stylianos Chatzimanolis (University of Tennessee Natural History Museum). Finally, we thank three anonymous reviewers for comments that greatly improved the manuscript. This research was funded by the USDA Forest Service, Southern Research Station including a grant from Forest Health Protection’s Evaluation Monitoring program (SO-EM-17-04).